I am a proud owner of '93 Nissan R-33 GTS Turbo. However, since I got some mods done - like a Nizmo exhaust, K&N air filter, blow-off valve, front mount intercooler and high/low boost controller - I have had a cutting out problem. Everyone I ask about it tells me a different story; I recently got the timing belt and pulleys changed thinking the timing might be out, but it has not fixed the problem. I am looking forward to your comments and advise on what else I need to do. Thankyou and regards. If the engine is boosting to more than about 14 - 15 psi it's likely you're running into a boost cut, which cuts the injectors and/or ignition. For a solution, companies such as ChipTorque or PowerChip (in your hometown of Melbourne) should be able to sell you an electronic device that either completely eliminates the boost cut or raises the limit to a higher boost pressure. 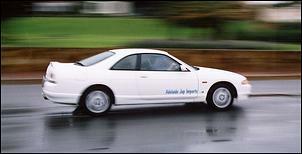 Hi - I'd just like to query your VVT-i Soarer Review. As the proud owner of a 1994 TT Soarer (non-VVT-i) I can honestly say that I too have the 'semi-striped' taillights of your 1998 vehicle. Looking at the production timetable it is clear that both the revised front and ANOTHER change to the rear lights occurred in August 1996. Either your test vehicle had been in an accident or the lights have been swapped back by the original owner. The 'true' 1996+ lights are split into 3 sections with a purple sort of cover on them. Check with Penrith Toyota if you want a look at some new ones. I'd also just like to comment that your reviews have always been excellent and about as unbiased as you can get. I particularly like the comment at the end of each article describing where you got the car. Keep up the good work. Hey, you guys have a great site with lots of useful info. 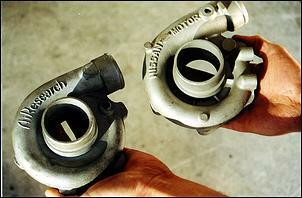 I own a 1987 TX5 Ford Telstar Turbo with the non-intercooled 2.0-litre engine and was just wondering if you had any tips on getting a bit of extra power. Do you think that this engine/car has any potential? I have fitted a 3-inch pipe off the turbo, a hi-flow cat and 2 ¼-inch pipework for the rest of the system - except for a 3 ½-inch tip. There's also an Autometer boost gauge, but that's about it so far. 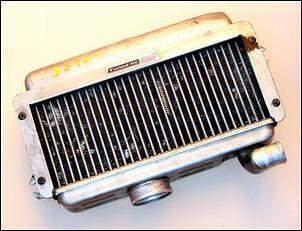 I was thinking of a cold air intake to the standard air box. What do you think? I have also recently been looking at intercoolers that I could fit; I have been lucky to get my hands on a WRX STi top-mount one, but have been told that it is too deep and a bit restrictive to front-mount on my car. Any help or ideas would be great. Thanks. Yes, Luke - any turbocar has great budget tuning potential! 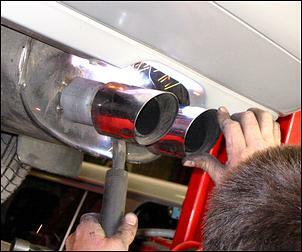 Your existing 3-inch exhaust off the turbo sounds good, but for maximum power we'd like to see the pipework maintain a diameter of at least 2.5-inch throughout the rest of the system; 3-inch is, of course, even better from a flow point of view. Also, what sort of muffler(s) are you using? They should be of the straight-through variety to maintain maximum gas flow. The air intake sounds like a good next move. It appears that the early TX5 Turbo uses a large metal airbox - we reckon it should be dead easy to cut a 3-inch hole into its lower section and run a cold air feed pipe from inside the wheel arch. Don't bother searching for another type of intercooler - the STi unit is pretty well ideal for your application, so long as you can find a space to fit it. The STi core flows plenty of induction air for 206kW and has quite capable heat exchange capacity - furthermore, you won't have any major heat soak issues if, as you say, you mount the core at the front of the car. Oh, and be sure to keep the intercooler plumbing fairly large in diameter and keep the number of bends to a minimum in order to reduce lag. With an exhaust, intake and intercooler we'd then up the boost a bit - 12 psi should be a fairly safe level, but be sure to check air-fuel ratios and be wary of detonation. Just thought I'd drop you a message to say how well I think the site is functioning now. I'm glad Julian decided to stay on, and I think you're keeping up the same standard which enticed me to subscribe in the first place. I found something which people interested in building a roll-cage might find interesting; it is a program into which you enter details of the tube sizes, thickness and angle to each other, and it will print out a template which you can use to accurately cut the tube mitre needed to join them. It's a simple, one file program which I have used and I can report excellent results. Download at http://www.ihpva.org/tools/tubemiter.exe The site is the International Human Powered Vehicles Association - check out the rest of the site too as there are some very interesting vehicles people are building out there. Thanks again guys. Re "Lung Transplant" - I found the article on the U12 Pintara very interesting. My mate had one of these years ago - what a grouse car. His was the Ti also, which had all the goods. I recently upgraded my exhaust on my Holden VT2 Berlina V6 and used the same methodology as you guys. Basically, the supercharged engine uses a twin cat twin muffler system so I got a hold of the twin system (which BTW is stainless) for zero dollars, two LS1 cats which cost me $170 a piece (second hand - in hindsight - I could have done better) and the supercharged rear muffler for $35 (ex delivery to HSV, so brand new). All installation cost me $140 for a bit of welding and some additional pipe. The gains I have seen have been far better fuel consumption and much more torque! So a twin system installed on a Commodore for $500? How can you go wrong?! 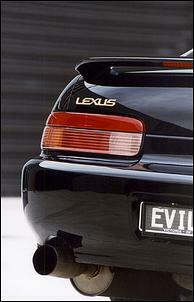 Why bother with expensive name brands when an exhaust from a supercharged V6 will MORE than flow enough for a NA V6?! Cheers. It looks like you know your way around cars so I was wandering if you could tell me what A/R is? Also, what are the differences in P, P, and Q-trims? A/R ratio is the area at the tongue of the turbo inlet divided by the radius to the centroid of the area. If that doesn't make a whole lot of sense, don't stress - the higher the A/R number, the slower the turbine will spin to produce a given boost pressure but the duller it will feel at low rpm. Do you have any plans to test Morey's Upper Cylinder Lubricant or Pro-Ma MBL8 oil additive? I'm curious, as the claimed advantages of many of these additives seem to have been either discredited outright or were inconclusive under independent testing conditions. However, there appears to be scant information or opinions (at least on the net) about the above items. Do you have any suggestions on methods for a layman like me to evaluate these types of additives? Thank you and keep up the good work. We do not have any plans - at this stage - to test either of the products mentioned. Short of pulling the engine down for a carbon inspection, testing of an upper cylinder lubricant would generally involve a before and after comparison of engine smoothness and driveability and whether or not any detonation problems are eliminated (which are sometimes linked to carbon build-up in the combustion chamber). The oil additive is pretty well impossible to fully test without a lab and extensive engine wear testing. All you can really do at home is compare before and after oil pressure and temperature in a variety of driving conditions. There might also be a slight power difference, an altered rate of oil consumption and an affect on noise of tappets etc. For more on testing, see "Testing Uniglide", "Militec-1 Metal Conditioner" and "Oil Analysis - Part 1".